Click to order the 2016 Fast Dates World Supetbike Calendar! The Aliens have landed! After a 12 hour plane flight from Prague, Czech Republic, Petra (right) and Jitka (left) arrived at Los Angeles International Airport on the Wednesday before the Laguna Seca SBK race weekend where they were greeted by me and would spend the first night of their California visit at my house, before we loaded up the car to make the Thursday drive up the California Pacific Coast Highway 1 to Carmel and Monterey. Both these beautiful Czech mates were already official FastDates.com Calendar Kittens having shot for the Calendars with contributing Italian photographer Max Oliana at the 2012 and 2013 SBK rounds at Bruno and Silverstone for the current 2014 and 2015 Fast Dates World Superbike and Garage Girls PinUp Calendars. Now we would be shooting for the 2016 Calendars. Our drive up to Monterey started at the local convenience store near my house where the girls bought 18 oz beers to help get the day started. I'd soon learn that in Czech, just like in Germany, the locals drink beer rather than water, and they drink a lot of it! I was constantly watching for police to make sure we weren't busted for driving with "open containers" which is a severe traffic fine in California. Two hours north of Los Angeles we made made our first stop of the day at the quaint little fare and wine making town of Los Olivios. We walked around the town and visited the shops, art gallersis and an old chrch, sampled wine at the Alta Maria Vinyards store, and had a wonder lunch on the front porch of my favorite restaurant there. Our ride was my awesome 2002 BMW M3 which has been upgraded with Dinan engine mods, Brembo brakes, H&R race suspension and wide BBS race wheels running 255/35 and 285/35-18 Nitto rubber. Plus of course a Valentine One radar detector to watch out for the heavy California Highway Patrol radar on our high speed run. It was 20 years ago in 1995 that SBK World Superbike first came to Laguna Seca, and as the Fast Dates Calendar producer I began working with WSBK producers Maurizio and Paolo Flammini. That first year I was excited to provide my beautiful FastDates.com Calendar Kittens, who would be at the track on race weekend to shoot with all the top factory World Superbikes, to also serve as the official SBK grid and podium girls on race day. Stopping at Hearst Castle along Highway 1 in San Simeon to look at the African Zebras which run wild on the property. 1920's newspaper baron millionaire William Randolph Hurst built a huge castle home on that mountain top hidden in the clouds, and imported many native animals from Africa to run wild and breed on the huge property grounds. It's now a Stare Park. Jitka and Petra are stunningly tall 6-foot 2-inch long legged, beautiful blond hair professional super models hail from Prague, the capital of the Czech Republic, and have been featured on SBK world TV race broadcasts and in the Fast Dates World Superbike Calendar the last 3 years. They stand at the front of the SBK World Superbike starting grid towering above the race bikes and riders in their uniforms with umbrellas to showcase SBK World Superbike, the Championship's title sponsors Pirelli Tires, Agip Fuels and Lubricants, and Alfa Romeo Automobiles. In their official uniforms with 6-inch heels on their platform boots, the show stopping beautiful blond super models can intimidate the bravest factory racers and experienced photographers! After San Simeon, the Santa Lucia Mountain range pushes up to the edge of the Pacific Ocean and the Coast Highway rises up over a quarter of a mile above the ragged coastline. The result is the most beautiful highway drive in the world. This was Jitka's first trip to America, while it was Petra's 2nd California trip, her Czech boyfriend having surprised her with a California a road trip from San Francisco to Las Vegas to the Grand Canyon to San Diego, then Los Angeles and back up the coast to San Francisco just 6 weeks earlier. Here we stopped at an overlook where we got to fed ground squirrels and watch barking seals playing on the beach below. Could there be two more adorerable Calendar Kittens! Petra and Jitka near Big Sur at our last picture stop on Highway 1 before arriving in Carmel / Monterey on Thursday evening. Driving the Pacific Coast Highway on a quiet weekday with very little traffic should be on everyone's bucket list. On Friday evening after Superbike Practice at Laguna Seca, and then again on Saturday after Superpole, it was time for us to get to work shooting with all the top factory World Superbikes for the next 2016 edition of the Fast Dates World Superbike Calendar. Here the Kittens shoot with Marco Melandri's factory Aprilia RSV4 which would win race One on Sunday. Team Pata Honda's Jonathan Rea was happy to step in for a few pictures with the Kittens where we were shooting his team Ten kate Honda CBR1000R in front of their pit garage. 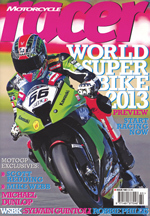 Eugene Laverty's Volt com Suzuki GSXR1000 gets its turn to shoot for the Fast Dates Calendar with Petra. Here i am wrangling the Kittens and the factory World Superbikes for the annual Fast Dates Calendar shoots on Pit Lane on Friday afternoon / evening. It's always a challenge to have the bikes made available to shoot before they are torn down and rebuilt by the team mechanics for the next day's track activities. The only rider in the World Superbike Paddock tall enough to match the Czech Kittens 6' 2" height was Leon Camier who was racing for the new MV Agusta team. During the Friday lunch break at the track the Kittens and I visit all the SBK team garages to give them a copy of the new Fast Dates Calendar photographed the previous year, and to remind them of the new Calendar shoot that evening. Any team bikes that are torn down and not available to shoot on Friday, we have to try to reschedule them on Saturday, and sometimes even as rushed as race day on Sunday. This year the team Ducati race bikes were always apart, when not on the track, and only available for 5 minutes on Sunday evening after the races, just before it was loaded into its air shipping container for return to Europe. While shooting the Alstare Bimota bike, rider Ayrton Badovini and the team mechanics joined Jitka and Petra for this team photo. Diminutive mechanic Shariffo seems to be all hands every time he gets next to Petra and gets a playful scolding. It was so easy and fun to work with these girls, they knew how to pose and didn't need direction, they were't freaked out by all the people and photographers aroeund us during the shooting. They always had a great attitude. Quite a change from many of American models I've worked with at past Fast Dates track shots who had attitudes, were freaked out by all the onlookers and anoying photographers try to get in on our shoot without permission., And there have some models over the years who actually would break down in tears and walk away in the middle of the shoot. The Czech girls were just incredible. Petra and Jitka, here on the far left were the official SBK Superpole, Grid and Podium girls all race weekend. The tallest bond on the right in the Red Alfa Romeo uniform is Torrun Sivesind who is a Fast Dates Calendar Kitten in the 2014 Calendar. Below: Jitka and Petra with 20103 World Superbike Champion Max Biaggi's Aprilia in the 2014 Fast Dates Calendars . Above, Petra and Jitka award Saturday's Superpole Plaque to a very excited reigning World Champion Tom Sykes during the Paddock Show Interviews. Tom would win Race Two on on Sunday to extended his 2014 Championship points lead. Following the Laguna Seca WSBK weekend, the two Czech super models were invited to stay at my home in Los Angeles the ten days where I played tour guide for them at the city's most exciting tourist spots, and found a little time for additional Calendar shoots in my studio. Then the next weekend they appeared at my 23rd annual 2014 LA Calendar Motorcycle Show & Concourse on Sunday July 20th, held this year at the Malibu Golf Course. The Calendar Motorcycle Show continues its tradition as the premier outdoor streetbike event in America with the Calendar Bike Building Championship & Concourse d' Elegance, top Celebrity Custom Builders, selected Vendors and Exhibitors, and the Calendar Girl Music Show. The Show always kicks off the world premier of next year's new 2015 FastDates.com Motorcycle PinUp Calendars featuring the world's top road race and custom motorcycles with the beautiful Calendar Kittens featured in the Calendars in attendance at the Show. Our official SBK World Superbike Kittens on the podium at laguna Seca with Miss Prosecco Champaign girl Michelle Eastman. Here we are playing tourists at Griffith Park Observatory in the Hollywood Hills above Los Angeles. This location provides an incredible view of the Downtown and greater Los Angeles to the Pacific Ocean, and behind us the famous Hollywood sign. Built in the 1920s, Griffith Observatory was the most significant planetarium in America at the time, but it quickly became obsolete as the City of Los Angles grew next to it and the city's night lights overpowered the night sky. The Observatory was made famous as a location in the hit 1955 troubled teen movie "Rebel Without a Cause" staring James Dean and Natalie Wood. Monkeying around! 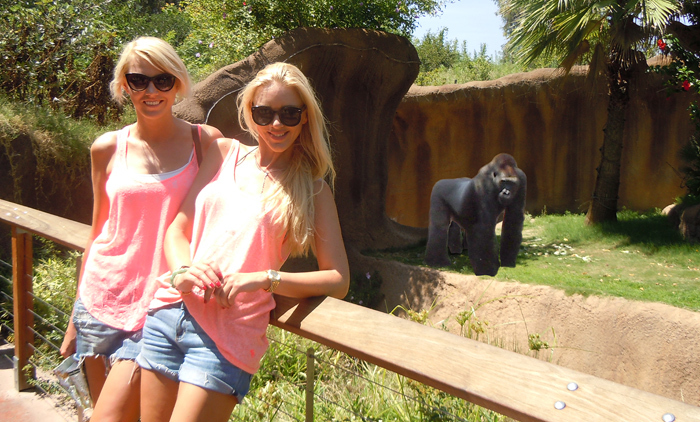 On one of our tourist days I took the girls to the Los Angles Zoo, were we stop at the Gorilla enclosure. The following weekend after Laguna Seca World Superbike, Both Jitka and Petra will joined me premiering the new 2014 FastDates.com Calendars at the LA Calendar Motorcycle Show and fans will get to meet them in person, have an opportunity pose with them and bikes for professional pictures by HighwayPhotos.net, and purchase autographed copies of the new Calendars. On Monday following the Show the girls will also be shooting with the winning bikes and builders at the Calendar Show for next season's Calendars. This year the 2014 LA Calendar Motorcycle Show & Concourse d' Elegance took place on Sunday July 20th at the Malibu Golf Course off Encinal Canyon Road and Mulholland Road, between Pacific Coast Highway 1 and Hwy 101, in the beautiful Santa Monica Mountains, not far from the legendary motorcycle gathering spot The Rock Store. General Admission was just $20, with optional VIP Admission $40 which includes in-show display parking for special interest bikes, an awesome Food Truck Lunch w/ Beverages from the famous Baby's Badass Burgers and The Grilled Cheese. To see additional pictures and the story go to - Calendar Bike Show. I've never meet or had the pleasure of working with two nicer models, and now the closest of friends, Petra and Jitka. It was so wonderful to spend two full weeks with them, have them stay as guests at my home, show them around Southern California and have them treat me like a king in return! They often make breakfast and lunch for me, helped with the laundry and house cleaning, and were just genuine awesome people. We will be closest of friends forever and I look forward to accepting their invitation to visit them at their homes in the Czech Republic. On the morning I drove them to the airport to fly home to Prague they presented me with this framed and signed picture of the three of us at Camel Beach. Memories to last a lifetime. Thank you girls! Order Jitka & Petra's Calendars!